"It really is more natural to believe a preternatural story, that deals with things we don’t understand, than a natural story that contradicts things we do understand." 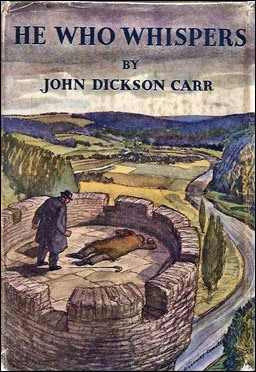 Last week, there was a sudden avalanche of reviews of the work of one of the greatest mystery writers who ever lived, John Dickson Carr, who mastered the art of crafting seemingly impossible crimes and was one of the pioneers of the historical detective story – which is an often overlooked achievement of his. The titles under examination were It Walks by Night (1930), The Plague Court Murders (1934), The Unicorn Murders (1935), The Burning Court (1937), The Emperor's Snuff-Box (1942) and The Gilded Man (1942). A nice little sampling from Carr's early-and mid period, which were his Golden Years, but the sample was not entirely representative of this period, because none of my fellow reviewers had picked a Dr. Gideon Fell novel to discuss. So this gave me the excuse needed to ignore my semi-sentient TBR-pile and return to a fan-favorite from the Dr. Fell series. 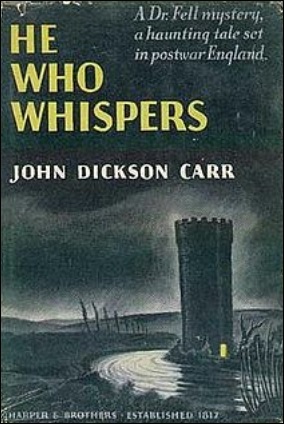 He Who Whispers (1946) is considered by many fans as one of Carr's masterpieces and some even think the book is superior to the other monumental title from the same series, The Hollow Man (1935), which earned its reputation as a classic for its expert handling of a complex, overly ingenious plot – preventing the ending from becoming a cluttered, tangled mess. You can say that the book, while being somewhat artificial, is the fantastic done right. But what readers seem to admire about He Who Whispers is the delightful simplicity of the well-clued plot and the tense, but understated, atmosphere of the story. And the human element at the heart of the book that turned a sordid, slap-dash crime into "a miracle in spite of itself" and ruined a second cleverly planned, near perfect murder. So the book is a treat for fans of the Golden Age (locked room) mysteries, but I'm getting ahead of myself again. He Who Whispers begins when the London-based Murder Club reconvenes for the first time since the outbreak of World War II. However, the first peace-time gathering of the club can hardly be described as a success, because only three people turn up and two of them aren't even members. One of the two guests is a distinguished historian, Miles Hammond, who received an invitation to attend from Dr. Fell and the second guest is a woman, Barbara Morell, who notices that the whole club has, sort of, disappeared – all except for the scheduled speaker of the evening. Professor Rigaud of French Literature was supposed to talk about the Brooke case, in which he was personally involved, but now has to tell his remarkable story to an audience of two. But what a story! The professor's story takes place in 1939, in the small French town of Chartres, where the largest leather manufacturing company was owned by an Englishman, Mr. Howard Brooke, who lived a quiet, harmonious family life with his wife and son, Harry. A peaceful life that was uprooted when his secretary, alarmed by the looming war, returned to England and her replacement, Fay Seton, irrevocably changed their lives. Harry becomes infatuated with Fay and convinces her to marry him, but the engagement is followed by a malicious whisper campaign and a string of anonymous letters addressed to her future father-in-law. As a consequence, the locals have thrown stones at her, convinced that she's a "drainer of bodies" and "killer of souls," but Mr. Brooke has come to see her as an immoral woman and is determined to buy her off – which ends with his inexplicable death at the top of an old ruined tower. Mr. Brooke asked Fay to meet him at the top of Henri Quatre's tower, standing on the bank of a river, which has been reduced by time and conflicts to a crumbling, "stone shell" with a staircase leading to a flat roof. There was a family picnicking on the grounds below, who swear nobody else climbed the tower, while the unobserved, river-side part of the structure is forty feet high. And as "smooth as a wet fish." Only someone with the power of levitation could have approached Mr. Brooke, stabbed him with his own sword-stick, vanish again without being seen by the people on the ground. So the local police, unable to come up with an alternative explanation, shelved the case as a suicide. However, that's not the end of Fay Seton's tragic story. On the day following the professor's curious tale at the Murder Club, she turns up on Hammond's doorstep as the trained librarian he had requested to help him catalog his late uncle's extensive book collection. Admittedly, this coincidence is the only aspect of the story that feels strained and unnatural, but Carr tried to make this plot-shift look as plausible as possible. Once you get pass this point, the story becomes it old brilliant self again. Seton is a genuine tragic character, one of those pitiful souls who are born into an endless night, with misery dogging every step they take in life. So the rumors, of her being a vampire, come back to life when Hammond's sister, Marion, is nearly frightened to death. Apparently, someone, or something, floated in front of her bedroom window and whispered to her. Similar to how the vampire, in folklore, "whispered softly" in order to throw "the victim into a trance." Only reason Marion lived to tell about it is because she took a shot at the entity. So there you have the double-pronged problem facing Dr. Fell: a seemingly impossible stabbing on top of crumbling castle tower in pre-war France and an attempted murder in the present by trying to scare someone to death. Only link between the two cases is the presence of Fay Seton. Dr. Fell's unraveling of all of these plot-threads demonstrates why his creator was the undisputed master of the impossible crime story, but one of the two things that really impressed me this (second) time around were the crisp clues – which helped me fill in the details about the explanation time had obliterated from my memory. I simply marveled at how Carr was capable of hiding the rather obvious murderer and at the same time dangle this person in front of your eyes. The other part that impressed me was the simplistic, but depressingly human, truth that lay behind the murder of Mr. Brooke in France. There are no gimmicks or cheap, shop-worn magic tricks, but a combination of all the good and bad aspects one finds in humanity. And in this particular case, it resulted in a seemingly impossible murder. Once Dr. Fell reconstructed everything that occurred on the top of that ruined tower, you feel like you just returned from a funeral. The depressing ending doesn't do much to lighten the dark, tragic mood, but not every story needs a happy ending and this is one of them. In summation, He Who Whispers can be considered as one of Carr's half dozen, or so, masterpieces, which has everything from a well-worked out solution, splendid clueing and superb characterization to actual tension and a grim, foreboding atmosphere – that was, at times, beautifully understated. One of the best titles from the post-WWII years of the Golden Age. "Nothing is impossible... it might be improbable, but not impossible." Shin honkaku is the name given to the neo-orthodox movement of traditionally-minded mystery writers in Japan, who emerged in the early 1980s when socially-conscience crime-fiction dominated the scene, which is a dominance they ended and the movement is still going strong after more than 35 years – having set their sights on conquering the West. 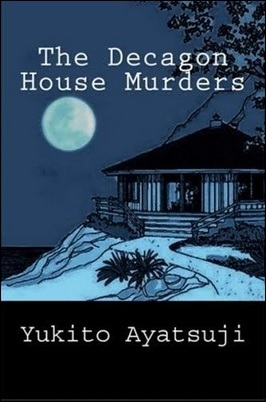 Several fundamentally important shin honkaku works have already appeared in English: Soji Shimada's Senseijutsu satsunjinjiken (The Tokyo Zodiac Murders, 1981), Yukito Ayatsuji's Jakkakukan no satsujin (The Decagon House Murders, 1987) and Alice Arisugawa's Koto Pazuru (The Moai Island Puzzle, 1989). All of them were well received here in the West and made readers, like yours truly, yearn for the next translation. However, they also tend to make us forget that there was an original honkaku period in Japan. A practically untapped reservoir of pure Golden Age detective-fiction we only got a taste of in Akimitsu Takagi's Shisei satsujin jiken (The Tattoo Murder Case, 1948), Seichi Yokomizo's Inugamike no ichizoku (The Inugami Clan, 1951) and a selection of short stories by Okamoto Kido in the criminally unknown The Curious Casebook of Inspector Hanshichi: Detective Stories of Old Edo (2007). Gratefully, John Pugmire of Locked Room International and Ho-Ling Wong, our guiding light in the world of Japanese detective stories, added a second volume of short stories from the Honkaku period to the list of English translation – entitled The Ginza Ghost (2017). 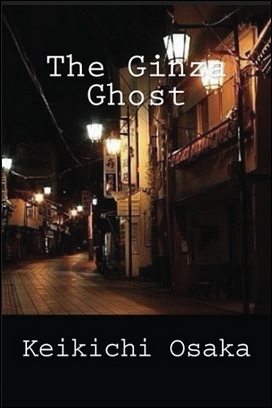 The Ginza Ghost is a selection of twelve short stories by Fukutaro Suzuki, written under the penname of "Keikichi Osaka," who was one of the leading lights in the genre during a dark time in world history. 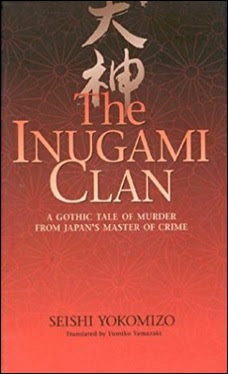 A period that would leave its marks on Osaka's work and even take him before his time when he was drafted into the army in 1943, but you can read a little bit more about the author's tragically short life in the introduction, which was penned by the author of the locked room galore known as Koromu no satsujin (Murder in the Red Chamber, 2004), Taku Ashibe. The short stories themselves, written during the 1930s, all strife to be the clever, inventive and fair-play mysteries we tend to associate with the thirties, but, as the back-cover noted, there's "an unreal, almost hallucinatory quality to them" - wedging most of the (locked room) stories from this collection between the weird menace and impossible crime category. I suppose you can best compare Osaka's crime-fiction with the stories found in L.T. Meade and Robert Eustace's A Master of Mysteries (1898) and the (scientific) impossible crime stories by Jacques Futrelle. So, in my opinion, Osaka stood closer to the mystery writers who bridged the gap between the Gaslight Era and the Golden Age than with the names closely associated with those illustrious decades between 1929 and 1960. And, to be absolutely clear, this is merely an observation and should not be taken as criticism. Before I take a gander at each individual entry in The Ginza Ghost, I want to point out that most of the stories have one or more footnotes explaining all of the cultural references made by Osaka. Some even have five or six footnotes! Obviously, Ho-Ling had been amusing himself by pretending to be Carl Horn. You're not fooling me, Ho-Ling! The first story of the lot, "The Hangman of the Department Store," was originally published in the October, 1932 issue of Shinseinen and was Osaka's debut as a mystery writer, in which the strangled body of a man is flung from the roof of a department store – several hours after he had died. A valuable pearl necklace, nicked from the jewelry department, was found next to the body. The explanation has an ancestor in an 1892 short story, "The Case of Roger Carboyne" by H. Greenbough Smith, but Osaka elaborated and improved on the idea. So a nice opening story to this collection. Next up is "The Phantasm of the Stone Wall," first published in the July, 1935 issue of Shinseinen, which centers on the public murder of the housekeeper of the reclusive Akimori family. Two witnesses saw a pair of men, dressed in white kimonos, assaulting the woman with a knife and fleeing the scene, but when they pursue the suspects they bump into a third witness. A witness who saw nobody coming his way! The case is riddled with weird, seemingly inexplicable inconsistencies, but Osaka provides the ending with a completely natural explanation. The third story, "The Mourning Locomotive," came from the pages of the September, 1934 issue of Profile and one of my favorite stories from this collection! Osaka tells the tale of one of "the most accident-prone of all locomotives" and its operators would hang "a cheap of wreath of flowers" in the locomotive, during "the mourning period," every time an unfortunate soul would be crushed beneath its wheels – which gave the locomotive its mournful nickname and reputation. Lately, the train keeps hitting pigs that are tied down to the railway. The story lacks a proper impossibility, but the sad answer to the bizarre incidents more than makes up for this. I (largely) figured out the answer to what was happening, but, once again, lost sight of the human element and got the motive completely wrong. The next story is a gemstone! "The Monster of the Lighthouse" was originally published in the December, 1935 issue of Shinseinen and has an imaginative premise with a genuine original explanation for a unique impossible crime. A distinctly bizarre incident occurred at the troubled Shiomaki Lighthouse: a gigantic rock has been flung at the top of the lighthouse and crushed the lighthouse keeper, but the only thing "able to throw it thirty metres up," from the "edge of the sea," is the sea monster that was seen and heard at the scene of the crime – something resembling “a terribly large boiled octopus.” The explanation for the rock-throwing bit is a technical triumph and anticipates the large-scale, architectural locked room stories by Herbert Resnicow from the 1980s. On the other hand, the truth behind the screaming monster is simultaneously completely natural and be the stuff horror stories are made of. "The Mesmerizing Light" was originally published in the August, 1936 issue of Shinseinen and the plot is Osaka's take on Futrelle's "The Phantom Motor," which gives an alternative explanation as to how a speeding car can vanish from a closely watched stretch of road. The road in this case is a twisted, snake-like mountain road with tollbooths at both end, but the vehicle responsible for a hit-and-run in the middle completely disappears between these two checkpoints. A case further complicated when the phantom car could possibly have been driven by the perpetrator of a murder discovered at the top of the mountain! The birthday-clue gave away the identity of the murderer, but the solution for the vanishing car is a different story altogether. Osaka evidently loved tricks that played around with the principle he used here, as there are several other such stories in this collection, but find this example to be as believable as it is unbelievable. I understand how the illusion was accomplished, but not that it would actually work and Osaka was probably aware of this. As he noted in the explanation that, "under normal circumstances," nobody would have made the mistake that created the miracle. "The Cold Night's Clearing" originally appeared in the December, 1936 issue of Shinseinen and is dark, cold and tragic story with a novel, but simplistic, take on the impossible situation of a set of footprints stopping in the middle of a field of unbroken snow. A long trail of ski-tracks lead from the home of a murdered woman into a snow-covered field, but the track become shallower and shallower. Eventually, they disappear entirely as if the skier had slowly faded out of existence. A stunt that becomes even more impressive when you realize the murderer took the victim's child from the crime-scene, which culminates in one of the most harrowing endings imaginable to an otherwise traditionally-plotted impossible crime tale. Osaka laughed at the people who claimed these type of detective stories were only about restoring order! The next story, "The Three Madmen," made its first appearance in print in the July, 1936 issue of Shinseinen and the story reminded me of the horror-tinged crime stories by Fredric Brown and Edogawa Rampo. Nevertheless, the plot of the story is pure GAD. The story concerns three patients of a private mental hospital, called "Knock Knock," "Diva" and "Injured," who escape together from the institute and only left the body of the director behind – who had his brains scooped out of his head! There would be two more bodies along the way and this makes for one of those who-of-the-three type of whodunits you often find Case Closed. Only weakness of the story is that the identity of the murderer becomes very obvious once you catch on to the game that's being played. "The Guardian of the Lighthouse" was originally published in Teishin Kyokai Zasshi of July, 1936 and is a clever, quasi-impossible crime story with a beautifully tragic and sad ending. One that gives a whole new interpretation to the phenomenon known as karoshi. A lighthouse keeper leaves his son in charge of the lighthouse, situated on a small island, when he has to travel by the only a boat to the mainland, but a storm prevents an early return to relieve his son. Luckily, the keeper sees to his satisfaction that his son and the lighthouse are performing their duty in the heavy storm. But when he returns the next day, his son has disappeared from the isolated island without a trace. The explanation is heart-wrenchingly sad and the given clues, such as the keeper's imagining he heard his son's voice, become somewhat depressing. The next story, "The Demon in the Mine," originally appeared in Kaizo in May, 1937, which stands as the longest story in this collection and a personal favorite of mine. An accident occurs in one of the side-tunnels of the Takiguchi coal mine and the last person present in the doomed shaft, Minekichi, is sacrificed in order to save the rest of the mine. This is, however, immediately followed by the murders of the men who sealed the shaft, but all of the potential suspects, with personal ties to the miner, have alibis and Minekichi is dead, or dying, behind a solid steel door – surrounded by solid bedrock and coal deposits. I loved the depiction of the dark, clammy rabbit-warren world of the coal miners and how it was used for a large-scale impossible crime plot. However, the motive and ending of the story also deserves full praise. My fellow locked room enthusiast, "JJ," was never so wrong as when he rated this story only three stars in his review of this collection. Note some interesting similarities with a locked room novel reviewed on here in April, namely The Owner Lies Dead (1930) by Tyline Perry, which also deals with a seemingly impossible murder inside a sealed mine after a disaster. "The Hungry Letter-Box" is a short short-ish story from the November, 1939 issue of Kitan and is alternatively titled "Love's Exploit," in which the love letter, written by a hairdresser, vanishes from a sealed letter-box. There's not much you can say about this short piece except that it's a short, pleasantly written story with a nice enough ending. One point of critic: Ho-Ling forgot to add a footnote explaining the cultural relevance of the protagonist putting on a hachimaki headband and "concentrated furiously on the problem." Finally, we have the title story of this collection, "The Ginza Ghost," which was originally published in the 1936 issue of Shinseinen and offers a locked room mystery that could have been penned by the late Edward D. Hoch. The story takes place in the backstreets of Ginza, where people go to amuse themselves, but the waitresses of the Blue Orchid are everything but amused when they become "witnesses of a baffling, inexplicable tragedy." They witness a murder on the first floor of a tobacco shop, situated across the street, but when the police arrive they find two bodies of woman clad in kimonos. On the surface, it appears as if the murderer committed suicide, after realizing she had been seen, but the medical evidence says that the supposed murderer had died before her victim – which suggests that a ghost had killed someone in "the middle of the jazz neighborhood." After all, nobody else had access to the locked shop. Osaka caps this delightful story, and collection, with an explanation and ending as clever as it's simple, which makes you long for more translations of both honkaku and shin honkaku detective stories. So, all in all, The Ginza Ghost is an excellent, properly balanced and historically important collection of short stories, which contained only one story that failed to live up to the other entries in this collection. And that's not a bad score for a short story collection. Not bad at all. On top of that, The Ginza Ghost consists almost entirely of impossible and improbable crime stories in the tradition of the previously mentioned Meade and Futrelle, but written with the fiery imagination of such Golden Age locked room artisans as Joseph Commings and Hake Talbot. So this is collection of detective stories that is of interest to both readers who love ingenious thought out plots as well as historians of the genre. Let me end this review by saying that I hope that the next collaboration between Ho-Ling and LRI will not take another year to appear. I'm sure I speak for most of us when I say that we really need a regular fix of Japanese (locked room) mysteries. "Because... we're in a detective story, and we don't fool the reader by pretending we're not." 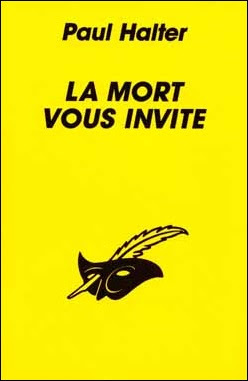 Paul Halter's La mort vous invite (Death Invites You, 1988) is his twelfth detective novel to be translated into English by John Pugmire, a modern-day merchant of miracles, which marked the second appearance of Halter's primary series-characters, Dr. Alan Twist and Inspector Archibald Hurst – who made their first bow in the preceding book, La quatriéme porte (The Fourth Door, 1987). Well, Hurst was only mentioned in passing by Dr. Twist, but that is a mere trifle of a detail. Pugmire published the English edition of Death Invites You early last year and it has earned the dubious honor of being liked by Halter's most persistent detractors. For example, Brad of the Ah, Sweet Mystery blog exclaimed, "EURAKA! Found a Halter I Like," which is a read he described as "a very enjoyable ride." So when even one of his most persistent critics managed to turn out a positive review, I decided to give a pass to the widely-panned L'arbre aux doigts tordus (The Vampire Tree, 1996) and move this particular item to the upper regions of the big pile. But does my take on the book concur with popular opinion? Let's find out! The opening chapter of Death Invites You finds Dr. Twist and Hurst drinking a beer in a London pub, while the latter complains that "criminals aren't what they used to be" and laments the passing of "the age of the master criminal." Dr. Twist is not as pessimistic as his policeman friend, because "a particularly tricky case usually turns up" when the inspector talks like that and, as if on cue, they spot a police officer at the bar, Sergeant Simon Cunningham – a promising young man who played a vital role in capturing the "Lonely Hearts Killer." Cunningham is engaged to Valerie Vickers and she is the daughter of a famous mystery writer, Harold Vickers, who's the leading practitioner of the locked room mystery! Vickers is an eccentric man, stoic and prone to mood swings, and often locked himself in his study for days on end when working on a book. So Cunningham was more annoyed than surprised when he received an invitation from his future father-in-law to a very important dinner, which had to be kept secret even from Valerie. A dinner that forced him to cancel a date with a very disappointed Valerie. A second invitation was dispatched to a newspaper reporter, Fred Springer, who's also "a renowned critic of crime fiction," but when they arrive at the home of Vickers they learn from Mrs. Vickers that her husband has one of his customary spells inside his locked office – where he has not emerged from for the better part of two days. The repeated knocks on the door are not answered and there's "an undeniable odour of chicken" emanating from the locked office. So they decide to charge the door, but when it gave way they tumbled into an otherworldly scene. The body of Harold Vickers, seated on one of three chairs, is slumped over a table sumptuously prepared for three people. Silver plates are filled with salmon, vegetables, roasted chickens, cheese, grapes, bottles of Burgundy and stuffed pheasants flanked by silver candelabras – beautifully illuminating the macabre scene with their flickering flames. A bullet hole was visible in the right temple, but the rest of Vickers' head was submerged in a large frying pan of boiling oil, which disfigured both his face and hands. The scene alone would pose a mind-bending challenge to Dr. Twist and Hurst, but there are other complicating factors. 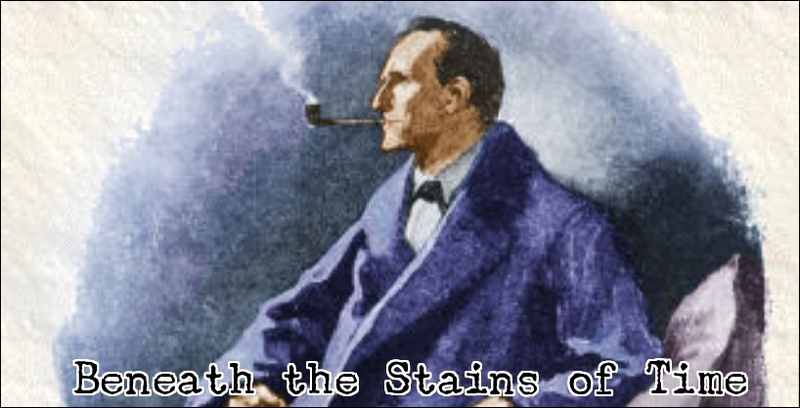 One of them is the inexplicable presence of a half-filled goblet of water standing beneath the window or how the crime-scene resembles the premise of both the victim's next book as well as an unsolved murder case from 1907. Or what to think about the suspects: Vickers has a brother-in-law, Roger Sharpe, who's a stage magician and acted as a technical adviser on his locked room stories. He probably knows how to pull off such an elaborate and deadly illusion. There's a second daughter, Henriette, who can best be described as soft in the head and disliked her own father as much as she loved her late grandfather – whose lingering memory haunts the investigation. Vickers also has a twin brother, living in Australia (where else? ), who went missing en route to England, which naturally adds yet another possibility to the complicated investigation. Finally, there's "a strange next door neighbor," Dr. Colin Hubbard. And there you have it! All the ingredients necessary to write a first-rate detective story: a mouthwatering premise, a banquet of clues and a dinner table full of suspects, but what we got instead strongly resembled the plot of a relative well-known short story. Robert Arthur's "The 51st Sealed Room," collected in Tantalizing Locked Room Mysteries (1982), tells of the gruesome killing of a mystery novelist, specialized in locked room stories, whose headless body is found inside a sealed cabin, propped up in front of his typewriter, with his severed head placed on the topshelf of a bookcase – as if it overlooked the bizarre scene of his own murder. Unfortunately, all of the clues and the setting of the scene were revealed to be nothing more than red herrings planted in order to muddle the waters. The murderer staged an elaborate and bizarre crime-scene purely to mystify the investigators. Only the solution to the locked room proved to be relevant to the plot. Same is kind of true for Death Invites You. The sumptuously prepared meal, the water-filled goblet and the burned features only served to mystify without rhyme or reason. You can't help but feel disappointed about that. Since you expect a John Dickson Carr fanboy, like Halter, to come up with at least a halfhearted attempt to provide a logical answer to all of these so-called clues. On top of that, the murderer was not particularly well-hidden, either, but (to be honest) neither was my identification of this character picture-perfect, because I assumed the obvious murderer was an obvious red herring and the obvious red herring the obvious murderer. In my defense, there was something in the narrative, early on, that put me on the wrong track and may not have been entirely fair. Anyhow, I switched to the correct murderer when the motive became clear to me, which was nicely worked into the overall plot. As a matter of the fact, the motive may very well be the best worked out aspect of the story. Gratefully, the locked room situation was also not entirely without interest and the technical nature of the trick, alongside with the motive, placed the book closer to the works of S.S. van Dine than to Carr's – especially his locked room novels (e.g. The Kennel Murder Case, 1932). I know the mere mention of Van Dine will probably make some of you curl your upper lip in disgust, but The Kennel Murder Case is, in my experience, the best and most readable title in the Philo Vance series. So it should not be taken as a slight towards Halter. 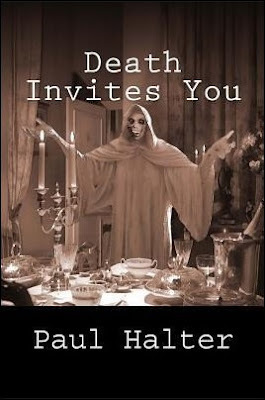 Well, I feel very divided about Death Invites You. On the one hand, I feel disappointed, even cheated, by the sumptuous banquet of red herrings that only served to (unfairly) obfuscate a relatively simple and straightforward plot. You can argue it served as plot dressing, but when you present such a crime-scene in a classical-styled locked room mystery, I expect at least an attempt at a logical answer. On the other hand, the story moved along nicely and the murderer, in combination with the motive, fitted together logically with murders. And the locked room trick was not bad either. The end result is a middling effort that is miles ahead of Le roi du desordre (The Lord of Misrule, 1994) and ranks roughly alongside Le cercle invisible (The Invisible Circle, 1996), but is left in the dust by Halter's best impossible crime novels – such as La septiéme hypothèse (The Seventh Hypothesis, 1991), Le diable de Dartmoor (The Demon of Dartmoor, 1993) and La ruelle fantôme (The Phantom Passage, 2005). Personally, I would not recommend the book, like "JJ" did, to people who are new to Halter, but readers who are already familiar with his flaws will probably be able to appreciate the story and forgive some of its short comings. After all, the book is a fun, quick read with the biggest flaw being that it did not delivered on all its promises. 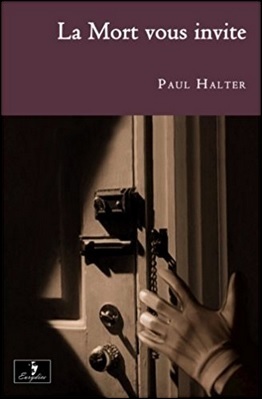 Since some of the criticism leveled at Halter is that he tries to deliver on the promises of a fantastic premise (e.g. Le brouillard rouge, 1988; The Crimson Fog), I can understand why readers like Brad liked Death Invites You. Well, I rambled on long enough in this slightly muddled blog-post and hope everyone can put up with a few more locked room reviews, but after the next three or four posts I will mix things up again. "Whenever bizarre phenomena occur that seem to defy human understanding, there are very few who can actually fish out the evil plots lurking behind them. And the longer one waits, the truth grows exponentially distant." 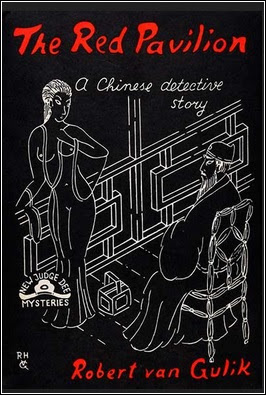 Recently, two of my fellow bloggers, Kate and "JJ," wrote tepid reviews of Robert van Gulik's The Chinese Maze Murders (1956) and The Willow Pattern (1965), which tempted me back to my beloved Judge Dee series to provide a counterweight to their blog-posts, but the last remaining title on my TBR-pile is Murder in Canton (1966) – generally considered to be one of the poorer entries in the series. So I decided to backtrack over previously traversed ground and return to one of my favorite titles from the series. The Red Pavilion (1961) begins with Judge Dee, accompanied by Ma Joong, breaking their homeward journey from the capital at the Sin City of 7th century China, Paradise Island. A town with gambling halls, wine shops and brothels on every street corner. Personally, Judge Dee does not approve of what goes on Paradise Island, but realizes such resorts are "a necessary evil" and a good warden, like Feng Dai, ensures that it is "a controlled evil." So, much to Ma Joong's delight, they decide to overnight at the pleasure resort. There are, however, a rapidly mounting pile of problems and unforeseen circumstances forcing them to extend their stay at Paradise Island – which begins with the difficulty of finding a place to spend the night. Upon their arrival, Paradise Island is in the middle of celebrating the Festival of the Dead, when the souls of the departed mingle with the living, but the consequence of these festivities is that lodgings are scarce. The Hostel of Eternal Bliss does have one unoccupied room, called the Red Pavilion, which has been the scene for a string of violent and inexplicable deaths. Someone took his own life in there only a couple of days ago! Nevertheless, Judge Dee waves away the objections uttered by the inn keeper and takes possession of the accursed room. A decision that would come back to haunt the magistrate, but he would make another one before the end of the day. The second lapse of judgment came during a brief encounter with a colleague, Magistrate Lo, whose presence on the island pertained to the tragic suicide of a promising Academician, Lee Lien – recently appointed a member of the Imperial Academy. On his way home, Lee tarried at the island and became infatuated with a woman, but when she turned him down he "cut his jugular vein with his own dagger" behind the locked door of the Red Pavilion. An elaborate key of "intricate pattern" was on the inside of the door and the only window barred with iron bars no more than a span apart. So it had to be suicide, assured Lo, as he asked Dee to stay a day, or two, in order to wind up the affair for him. And then hightails it out of there. Magistrate Lo had a good reason to leave the pleasure resort in a hurry: a famous courtesan and Queen of Flower of Paradise Island, named Autumn Moon, tried to sink her claws into the magistrate. Judge Dee had already met her, before taking over the investigation, but had given her the cold shoulder and angrily she mentioned that, only three days ago, a scholar killed himself because of her – which is the death Lo had been investigating. But the room would soon claim another victim. 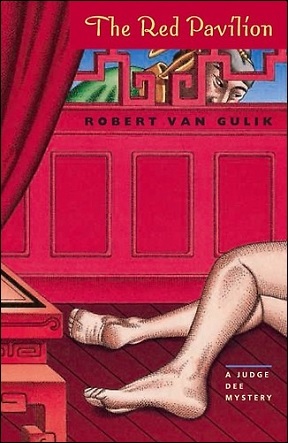 When he returns from dinner, Judge Dee finds that the bedroom door of the Red Pavilion is locked on the inside and a glance through the barred window reveals the form of a naked woman on the floor. The door is battered down and the body is shown that to be of Autumn Moon. She appears to have suffered a heart attack, but the doctor also discovers bruises around her throat. This suggests someone had been throttling her, however, there were "no marks of fingernails." So how was she attacked and how did the murderer entered, and left, the room when the key was on the inside of the door? Meanwhile, Ma Joong strikes up an acquaintance with a pair of delightful characters, Crab and Shrimp, who work for the warden of Paradise Island and they refuse to believe the Academician was the type of commit suicide, but, more importantly, they tell about another fishy suicide that took place in the same room over thirty years ago – when the father of the local wine merchant reputedly took his own life in the locked and barred bedroom of the Red Pavilion. So that's three inexplicable deaths, separated by three decades and three days each, which all had the same locked room as the scene of the tragedies, but Van Gulik provided the story with a different explanation for each case. A very ambitious attempt that has to be appreciated, but two of three impossibilities were a trifle weaker than I remembered. The past murder is only nominally a locked room and the then magistrate of the district only passed it off as a suicide because a deadly smallpox epidemic was ravaging the region at the time, which will come to play an important part in the two deaths several decades later. So the lack of a proper locked room trick can be forgiven as this supposed suicide and epidemic has far-reaching consequences. On the other hand, the locked room problem surrounding the Academician turned out to be a routine affair (Lo was sort of right there) with one of the oldest and unimaginative tricks in the book. However, the explanation for the death of Autumn Moon is one of those one-of-a-kind locked room trick tailored to the specific events and setting of the story (e.g. Alan Green's What a Body, 1949). A trick splendidly using such clues as the victim's poor health, the strange bruises, past epidemics, the supposed suicide from three days previously and the room itself to create an impossible crime that, in itself, function as a clue to the overall solution. 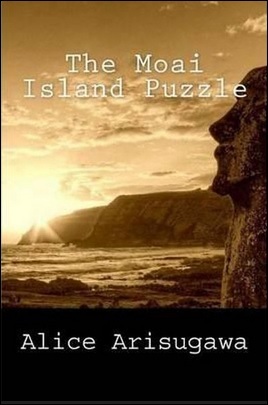 But where that overall solution really excels is when all of the plot-strands, including the three locked rooms, are twisted together with the theme of the book showing the consequences when the evil of past events are left unresolved – which revealed the excellent mystery I remembered reading all those years ago. A second consequence, story-wise, is that the nature of the case does not allow Judge Dee to act as an examining magistrate or detective, but as a correcting factor who lays the restless spirits of the sin-filled pleasure island to rest by covering everything up. Nobody is arrested, sentenced and escorted to the execution grounds. And he has a good reason to sweep everything under the carpet. So the past and its ghosts are finally laid to rest at the end of the Festival of the Dead, which was a nice, stylistic touch to the story. Overall, The Red Pavilion definitely stood up to re-reading with a solid, well-crafted plot that, when everything came together, strengthened the individual parts that looked a trifle weak on their own – which is the hallmark of a good plotter. I previously rambled about The Chinese Maze Murders (1956) and Judge Dee at Work (1967).